During the holidays many folks enjoy making gingerbread and decorating them with candies, frosting and all sorts of fun sprinkles. 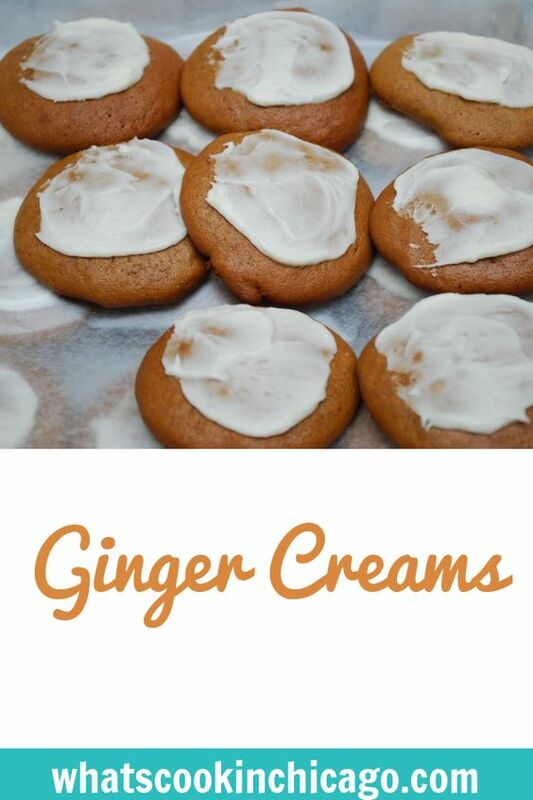 When my friend Rebecca made these cookies for my holiday cookie exchange this year, it was a tasty way to enjoy the flavor of ginger in cookies. It's a delicious combination of spices in this cookie, topped with a simple frosting... mmm! Gradually add 1 c. sugar creaming well. Add 1 unbeaten egg and beat well. Add the dry ingredients, alternating with 1 c. molasses and 2/3 c. hot water. Blend thoroughly after each addition. Chill dough for 30-60 minutes (can be chilled overnight). Drop by rounded teaspoonfuls onto lightly greased baking sheets. Bake at 350 for 9-12 minutes. Cook 1 minute on sheet, then remove to cooling rack to cool completly. Beat butter, salt, 1 1/2 c powdered sugar and 3 T milk at medium speed until blended. Gradually add remaining sugar and milk.